Keeping in view the recommendations made in the “National Policy on Older Persons” as well as the State’s obligation under the “Maintenance & Welfare of Parents & Senior Citizens Act 2007”, the Ministry of Health & Family Welfare had launched the “National Programme for the Health Care of Elderly” (NPHCE) during 2010-11 to address various health related problems of the elderly people. 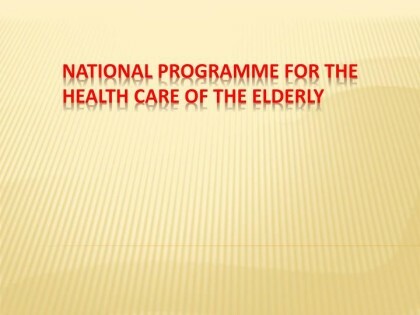 The major objectives of the NPHCE are establishment of Department of Geriatric in identified Medical Institutions as Regional Geriatric Centres for different regions of the country and to provide dedicated health facilities in District Hospitals, Community Health Centres (CHCs), Primary Health Centres (PHCs) and Sub-Centres (SCs) levels through State Health Society. Geriatric OPD, 30 Bedded ward for in-patient care etc. at Regional Geriatric Centres. Geriatric OPD and 10 bedded Geriatric Ward at District Hospitals. III. Bi-weekly Geriatric Clinic at Community Health Centres (CHCs). Provision of Aids and Appliances at Sub-centres. * No separate allocation of funds has been made for National Programme for Health Care of the Elderly (NPHCE), during 2015-16. NPHCE is the part of NCD flexible pool under the National Health Mission for which total allocation at BE stage for 2015-16 is Rs. 527.36 crores. At present, Government had launched following programmes/schemes i.e. under which, inter alia health care facilities are being provided to elderly people also in the country. National Programme for Prevention and Control of Cancer, Diabetes, Cardiovascular Diseases and Stroke (NPCDCS)– The programme is being implemented under National Health Mission (NHM) for intervention upto the district level includes awareness generation for Cancer prevention, screenining, early detection and referral to an appropriate level institution for treatment. National Programme for Control of Blindness (NPCB)This programme was launched in the year 1976 as a 100% centrally sponsored scheme with the goal of reducing the prevalence of blindness to 0.3% by 2020. Rapid Survey on Avoidable Blindness conducted under NPCB during 2006-07 showed reductionin the prevalence of blindness from 1.1% (2001-02) to 1% (2006-07. Under this programme there are provision for distribution of free spectacles to old persons suffering from presbyopia and free treatment for cataract surgery. III. National Oral Health Programme: Taking into account the oral health situation in the country, Government of India has initiated a National Oral Health Programme to provide integrated, comprehensive oral health care in the existing health care facilities with a view to improve the determinants of oral health, reduce morbidity from oral diseases, integrate oral health promotion and provide preventive services. National Programme for Prevention and Control of Deafness (NPPCD): This Ministry has launched this programme on the pilot phase basis in the year 2006-07(January 2007). Under this programme, hearing-aid is provided as per synergy between Assistance to Disabled Persons (ADIP) Scheme of Ministry of Social Justice & Empowerment (MSJE) and National Programme for Prevention and Control of Deafness (NPPCD) of Ministry of Health & Family Welfare. At present, the Programme is being implemented in 281 districts of 27 States and 6 Union Territories.